The average healthy adult has around 3mm of cartilage, to cushion the joints in the knee but a lifetime of use can take its toll on cartilage. A reduction in cartilage may lead to pain and reduced joint mobility. 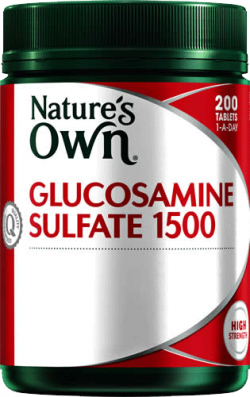 Naturally occurring in the body, glucosamine is one of the key building blocks of cartilage and synovial fluid which plays a role in maintaining elasticity, strength and lubrication of cartilage in joints. It’s involved in normal structure & function of joints and in the maintenance of cartilage health. Chondroitin is also naturally occurring in the body and is a major component of cartilage. Your bones are the structural framework of your body. Your body is in a constant state of building up and breaking down bone – bone problems arise when your body breaks down more bone than it builds up. This may lead to osteoporosis, a condition in which the bones become weak, brittle and prone to fracture. Your muscles have several important roles, depending on the type of muscle. For example, the heart is a muscle and it plays a crucial role in keeping us alive, pumping blood with its life-giving oxygen to every organ in the body. Your bones also rely on muscles to help keep your joints stable and to keep the body moving. What can affect bone and muscle health? How you act can have both negative and positive effects on your bones and muscles. Sometimes sports or other strenuous activities can result in injuries, fractures or muscle strains. Neglecting your bone health could increase your risk of developing osteoporosis. Magnesium – is a mineral that is important for nerve and muscle function. Regular strenuous exercise or physical exertion may increase the need for magnesium. Magnesium is also an important nutrient for the cardiovascular system . Calcium – a mineral that is crucial for bone health. The bones are the storage area for most of the body’s calcium; the rest of the body’s calcium is used to help maintain heart, muscle and nerve function and to keep the circulation healthy.If there is not enough calcium circulating in the body, calcium will be “stolen” from your bones, resulting in bone weakness. Vitamin D, which helps the body to absorb crucial calcium. The average healthy adult has around 3mm of cartilage, to cushion the joints in the knee but a lifetime of use can take its toll on cartilage. Nature’s Own Bio-Curcumin uses Meriva® a combination of Curcumin (the active form of Turmeric) with phospholipid for improved absorption.